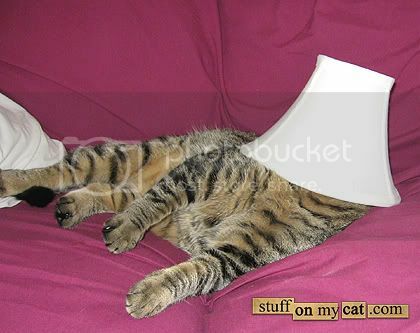 Stuff On My Cat is an interesting site since it well, shows pictures of people who put stuff on their cats. This ranges from breakfast plates to flip flops, stickers to underwear. 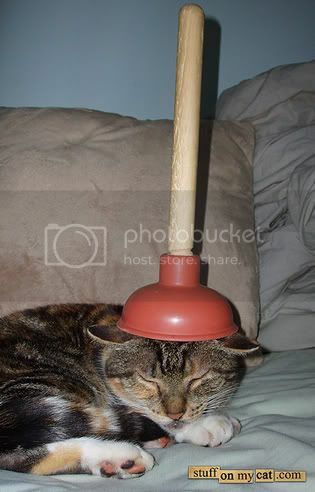 The site is supposedly updated daily and I just cannot fathom the silent rumblings coming from some of the cats to the just plain non-chalant attitude of "why is this plunger on my head?" I mean would you really want to kiss your kitty on the head knowing full well where that plunger has been?